Onion Creek is located off of HWY 128 near the gorgeous Castle Valley and Fisher Towers area - both excellent for hiking and climbing. Onion Creek actually extends for roughly 22 miles, but the best section, the Onion Creek Narrows, lasts for only 1 mile. 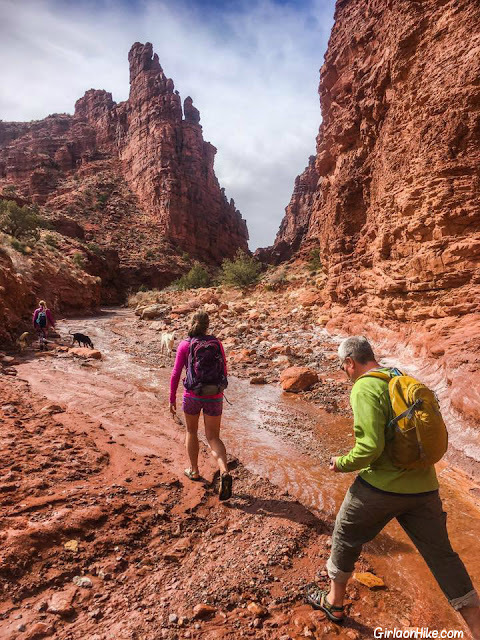 Because of the short distance, it's a great hike (really more of a walk) for the whole family - dogs will appreciate the cool relief of the creek on a hot summer day. 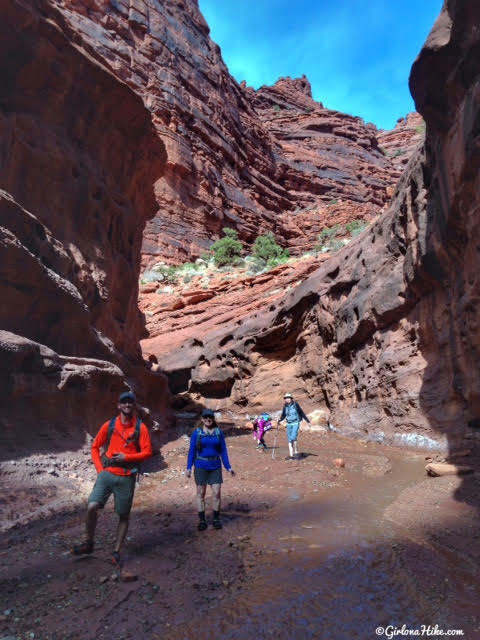 Despite it's name, you won't see any onions growing in this canyon - you'll see plenty of red rock, Moenkopi and Cutler sandstone which have eroded into many shapes and sizes, and otherworldly features that will make your jaw drop in awe. The surrounding canyon walls are at 400 ft at the tallest. And while there is no official trail per say, Onion Creek offers plenty to explore on your own. You will need a high clearance car to drive down Onion Creek far enough to reach the small parking area for the narrows. 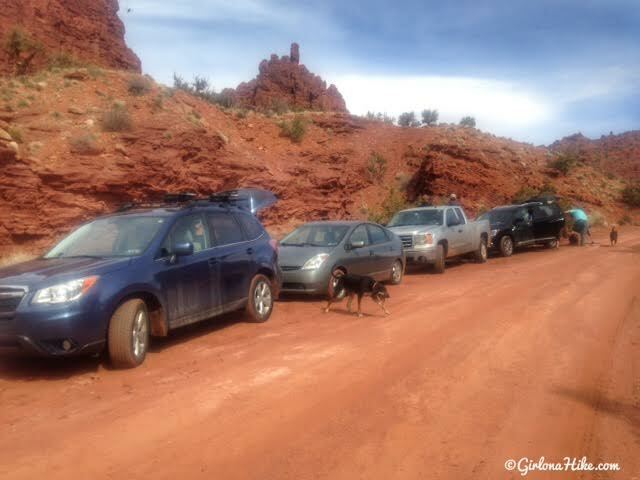 We had a few cars - a Forester, Tundra, and CR-V, which all made it just fine. Our friends in a van had to pile into the other cars. As you drive to the "trail head", you'll cross the creek roughly 20 times. You do NOT want to attempt driving in Onion Creek during or after a big rainstorm due to flash flooding. 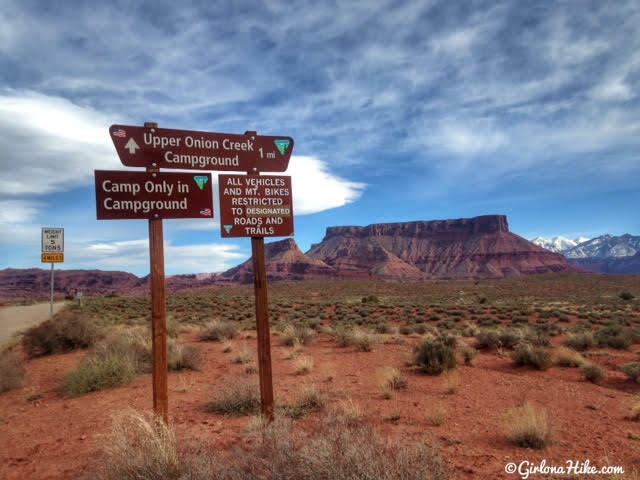 There are plenty of campsites nearby in the Onion Creek Campground as well as the Fisher Towers Campground (both fill up quickly during tourist season, mid-March through October). 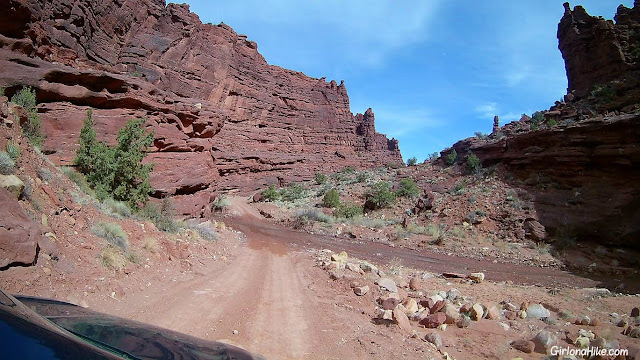 From Moab, head East along the Colorado River along HWY 128. 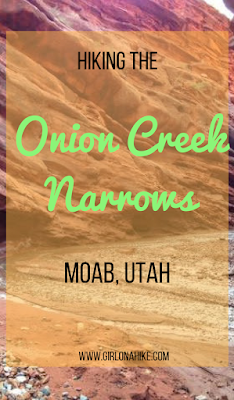 Drive 20 miles and look for the big brown sign for Onion Creek. Turn right and reset your odometer to 0. 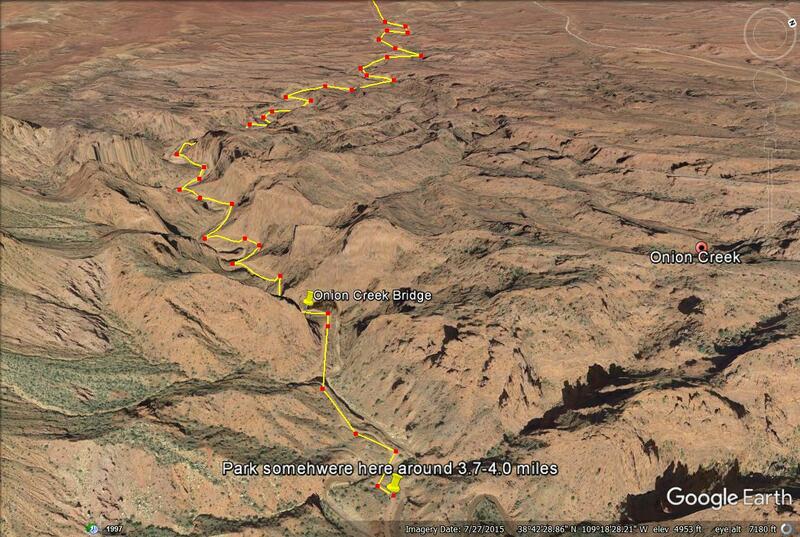 At 1/2 mile the road starts to narrow and will start to cross the creek. 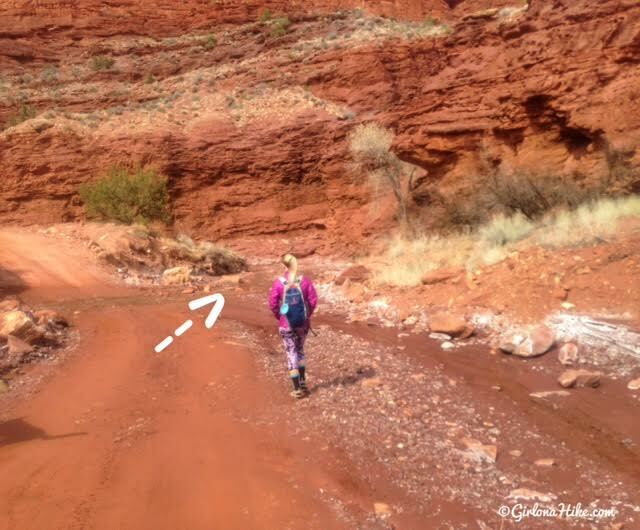 At 3.5 miles you'll cross a narrow bridge with a sign that says "5 Ton Weight Limit." Drive another 1/2 mile (approximately 4 miles total) to small pull-off area that 4 cars can park in. Here's a driving map. 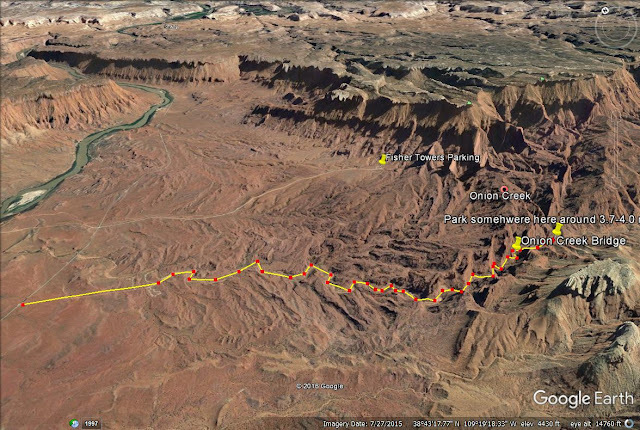 Distance: 2 miles total for just the Onion Creek Narrows; 22 miles if you want to mountain bike the whole road. As you turn onto Onion Creek Road, you'll immediately see the brown signs. Drive straight for 4 miles. Driving along the narrow Onion Creek Road - lots of stream crossings. Make sure your car has enough clearance to drive across the water without getting stuck. The drive alone is gorgeous though! At roughly 4 miles, there is a small pull out on the north side of the road, after one of the many stream crossings, and after you cross the bridge. Only 4 cars can fit. If there are more cars, you could continue driving until you found a safe parking area. 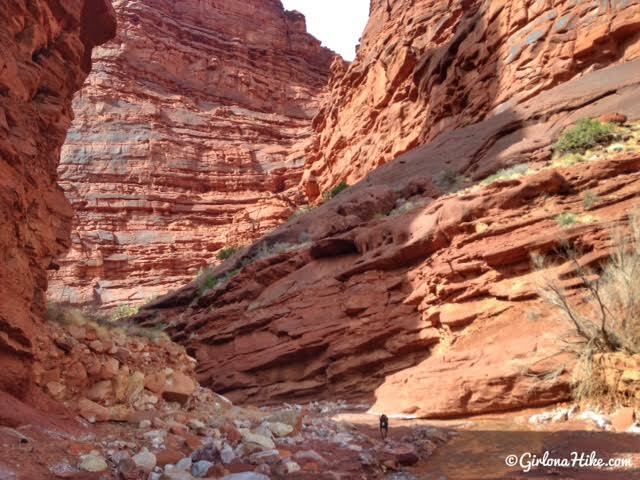 To find and start hiking the narrows, you'll hike back the way you drove (so East to West). Instead of hiking back along the road, start hiking right in the creek. Within the first 5 minutes the views were already amazing! 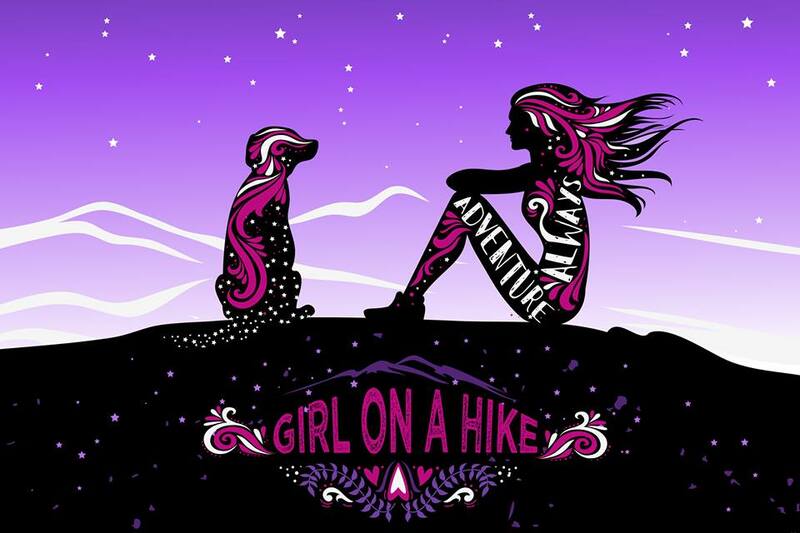 You'll definitely want to wear sturdy hiking shoes for this walk. I love my Chacos! You can see that all of us hand either a long sleeve shirt or light puffy on - the wind whips right through the canyon and it can still be quite chilly even in early March. 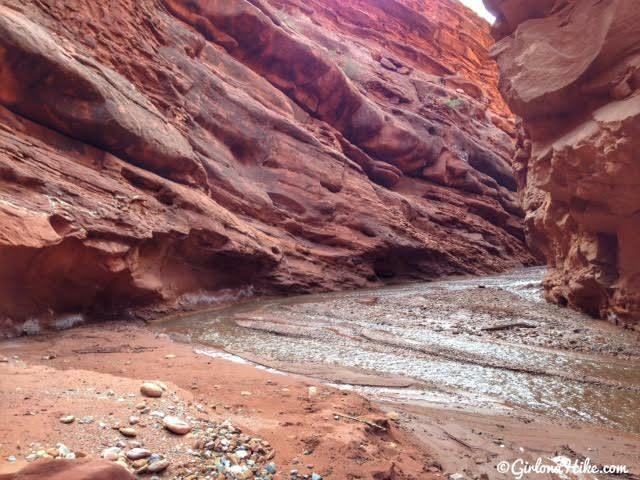 The water was pleasant enough to walk through though - very refreshing after hiking all morning at Corona Arch! 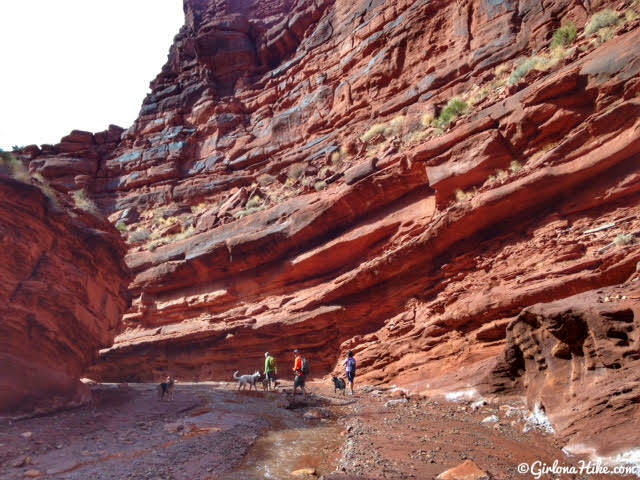 Simply follow the creek as it winds it way around the canyon walls. 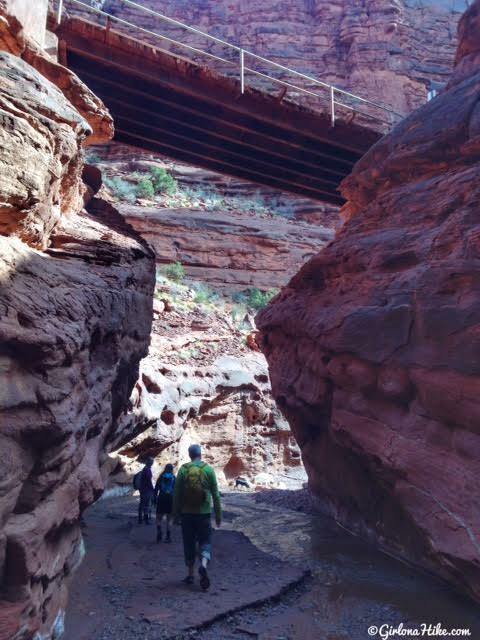 You should eventually be hiking under the bridge you drove across. 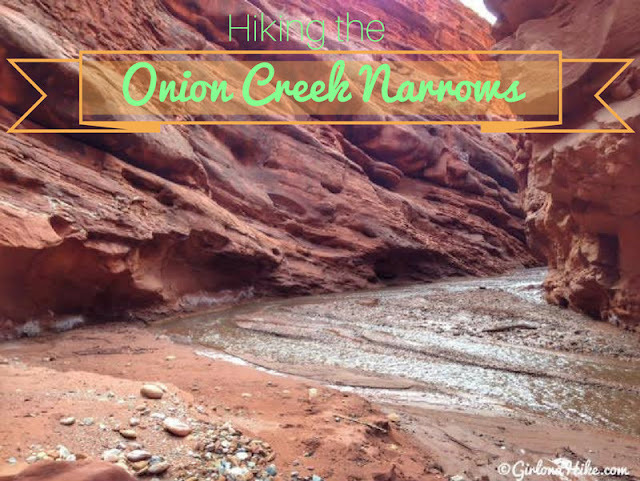 The best section of the Onion Creek Narrows only lasts for about 1 mile, so when you are ready to head back to your car hike back the same way. 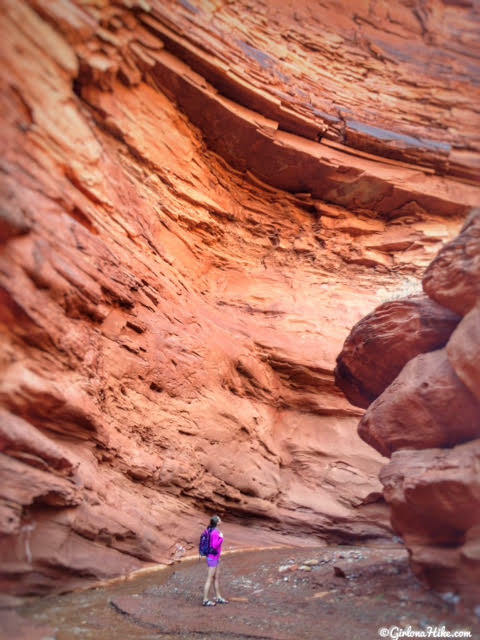 Again, there are plenty of side canyons you could hike up and explore. This is the driving map looking NE. A close up view of the driving map. 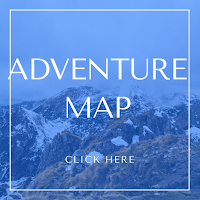 The hiking map is basically the same, all you need to do is hike back (or East to West) in the creek below the road for 1 mile. 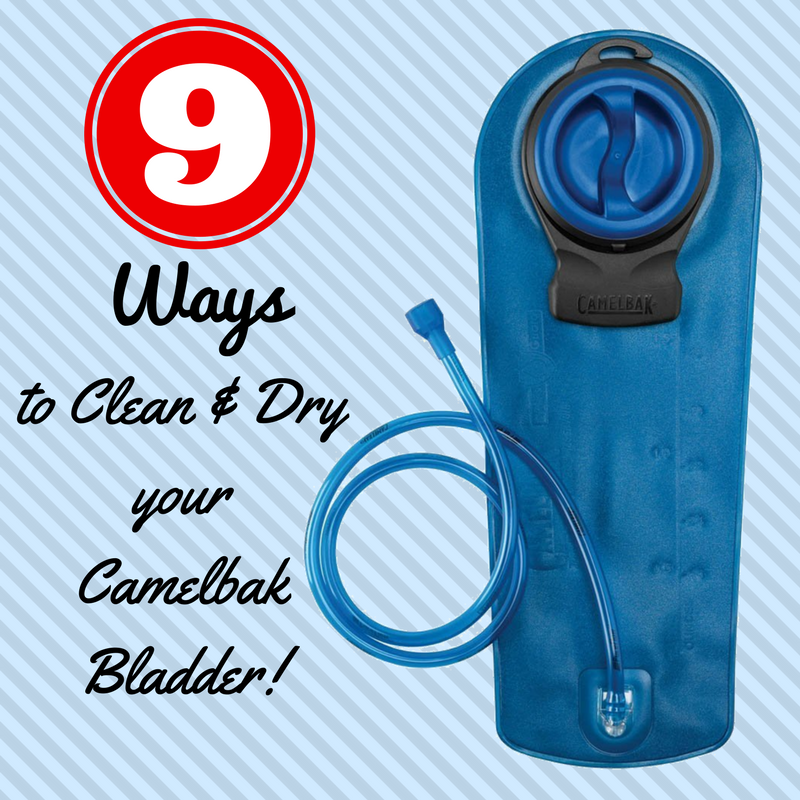 Don't forget to clean your camelbak after hiking! 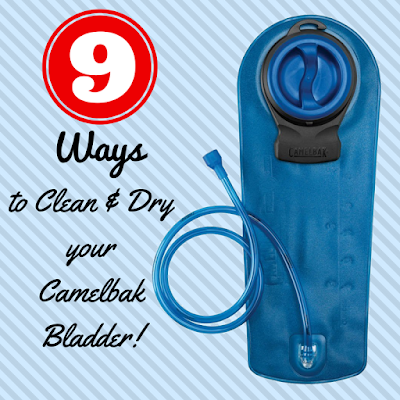 Here are 9 ways to Clean & Dry your Camelbak Bladder! This sounds fantastic. 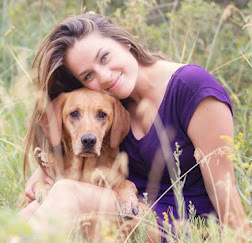 Thanks for the write up. We've driven this "road" before but I didn't know about the hike. Sounds excellent especially with warmer temps. 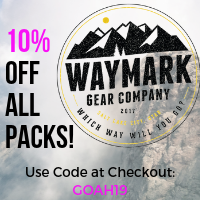 Thanks for another great suggestions! 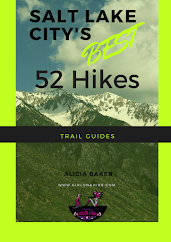 You bet - thanks for reading! Me too! 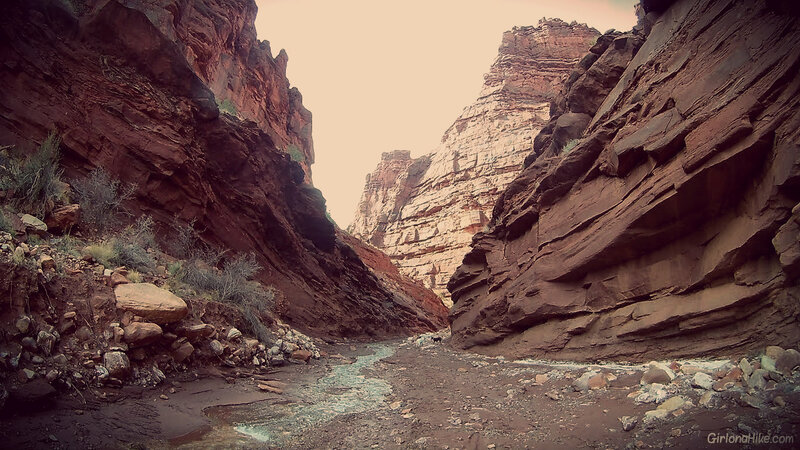 Driven, but haven't hiked the narrows. I'd love to try it out!